A Visual Studio template to help make the creation of an Inventor add-in easier. Creating add-ins has never been easy and because of that, there’s still a lot of room for improvement in the process. This template is an attempt to make the process of writing an add-in slightly easier. 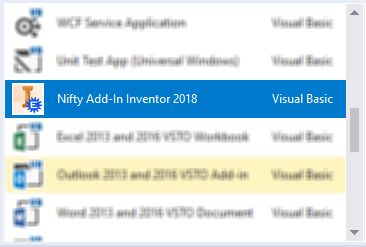 There are two files included with this product; the first is a Visual Studio template that you can use instead of the add-in template that’s delivered as part of the Inventor developer tools. The second is a document that goes into detail about what an add-in is and how to use the template. A big difference between the template delivered with Inventor Developer Tools template and this template is that this template creates a full running command and has some additional functionality to make adding new commands into your add-in easier. When you create a new project using the template and compile it you’ll have a working add-in with the new command shown below. You’ll need to edit the code to reposition the command button where you want it in the user interface and add the code so that when the button is clicked it does what you want, but the template creates all of the required framework for an add-in. Even though the template is set up for Inventor 2018, it will work for Inventor 2018 and later. The only thing in the template that is specific to Inventor 2018 is that it is referencing the Inventor 2018 Interop Library. You can continue to use this library in later versions of Inventor too. The main reason to update to a later version is if you want to use API functionality that is only available in the newer version.